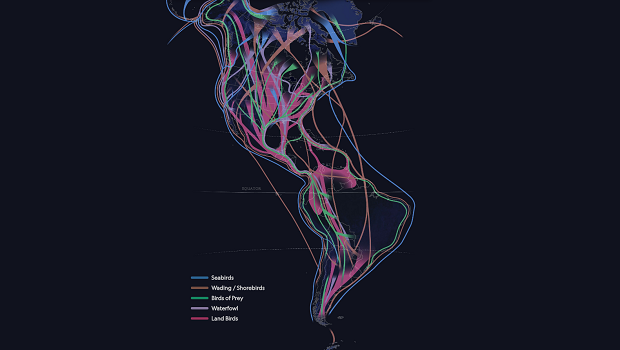 National Geographic has created a series of data visualizations illustrating how migratory birds make their thousand-mile flights to follow the “green wave”—the seasonal growth of vegetation around the planet. The maps demonstrate how the birds often take the most direct path, despite the prevalence of storms and predators, to conserve energy. The animations combine satellite data, models of bird abundance from the the Cornell Lab of Ornithology, and crowdsourced observations from birdwatchers.